The North Yorks Moors are, it must be said, completely covered in the traces of our prehistoric ancestors. Although obviously the traces in the lowlands have not fared anywhere near as well as those on the heights around Britain – particularly since the advent of agribusiness in the late 20th century – it seems also true to say that there was something special, for our ancestors, about the uplands – especially when certain high peaks could be seen for miles around, and monuments set with sightlines to those peaks. There are several such ‘sacred hills’ in the North Yorks moors (Roseberry Topping and Freebrough Hill especially), and you can see at least one of them from all the various neolithic monuments, from circles to cairns, and the Bronze Age barrows that followed them. 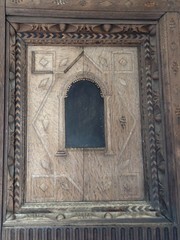 In a few days it is not possible to capture much of this heritage, only to attempt to take in a representative sample. My sample, additionally, included only those sites which I could access in an hour or so’s walk – there and back – so I certainly missed some sites which are deeper into the interior. Nonetheless, I think I managed to see some interesting monuments, including High Bridestones and the nearby Beacon Howe, Ramsdale Stone Circle, and the Brow Moor Monument and associated rock art features. I also stopped off at Whitby Abbey, Helmsley Castle, and on my way back home, The Twelve Apostles Stone Circle on Ilkley Moor. 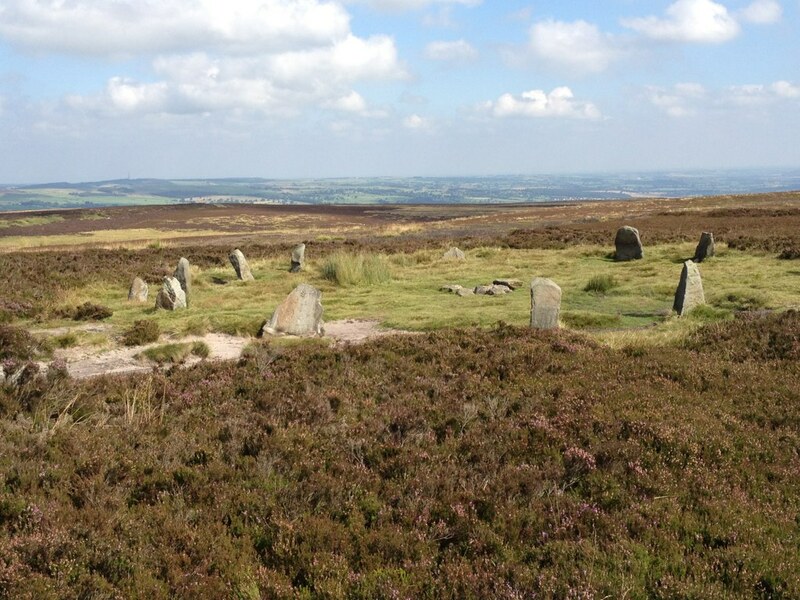 High Bridestones is a much distressed monument, comprising a number of standing and recumbent stones, and it is frankly unclear whether this is a stone circle and/or a stone row, although I have seen it described as both online. 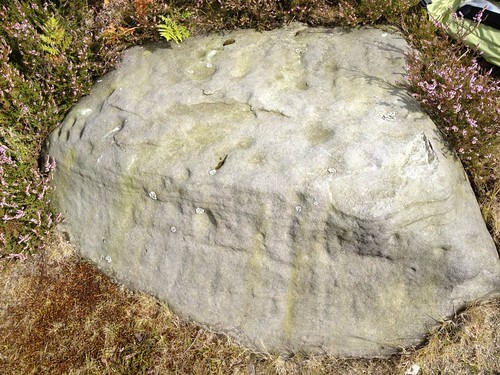 To my eye, there were only the three stones, in a row, that were standing, but one seemed to have sufficient large recumbent stones nearby to potentially have been a circle. There are also – reputedly – the Low Bridestones nearby, but I couldn’t find them, unless, indeed, what I had found were High and Low Bridestones and they were closer together than it seems on the map. This was a tricky business, working out quite what I was looking at! 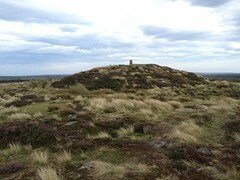 The nearby Beacon Howe, with a single stone standing at its summit and two at its foot, offered astounding views across the moors, and one wonders what (probably) Bronze Age chief lay buried here, overlooking the more ancient site of the Bridestones. The later Bronze Age monuments, celebrating as they seem to more individual burials, clearly mark a break from the seemingly more communal mortuary practices of the past, whilst at the same time gaining some of their sanctity through association with – by direct sightline – the older Neolithic monuments. This is perhaps at its clearest at Stonehenge, where a great number of individual Bronze Age burial mounds surround and overlook the older monuments. 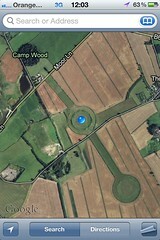 But it is also clear up here on the North Yorks Moors. 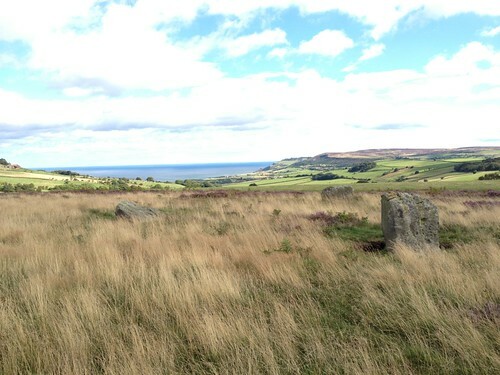 Further east, overlooking Robin Hood’s Bay and Ravenscarr, is Brow Moor, the focus of Smith and Walker’s book on Rock Art, and the Stoupe Brow Trail usefully takes one from a little carpark all around the moor visiting each mound and several of the earth-fast rock art stones. 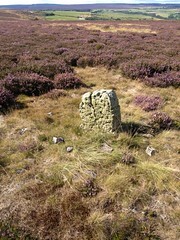 I was blessed with glorious sunshine for this walk and easily found the Brow Moor monument – carefully reburied since its excavation save for the single standing stone, and the single recumbent stone opposite, that were visible beforehand. This Neolithic mound with inward-facing rock art stones provides, according to Smith and Walker, a link to what they suggest may have been a trail from Millin Bay on the east coast of northern Ireland, via the Isle of Man, Morecombe Bay and the Aire Gap, to Flamborough Head and beyond to Scandinavia. The three-tiered cosmology of sky, earth, and underworld (familiar in ancient Peru and Australia, let alone Northern Europe) represented at sites along this trail through rock art, present a really interesting theory. Ramsdale Stone Circle, on Fylingdales Moor, provided not only an easy walk from a little carpark by the road (welcome on the same day as the much longer around Brow Moor) but amazing views across to Brow Moor itself, and north towards what may indeed have been Roseberry Topping in the distance. Eerily, there were the remains of a sheep’s skull, broken into many pieces, strewn around one of these three standing stones, adding atmosphere to the place! 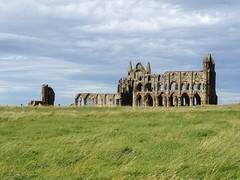 Whilst in the North Yorks Moors, of course, it would have been churlish not to visit, in addition to Rievaulx, and see first hand that classic view of Hammer horror movies: Whitby Abbey, where there is also an excellent little museum, and fine views over this little seaside town. 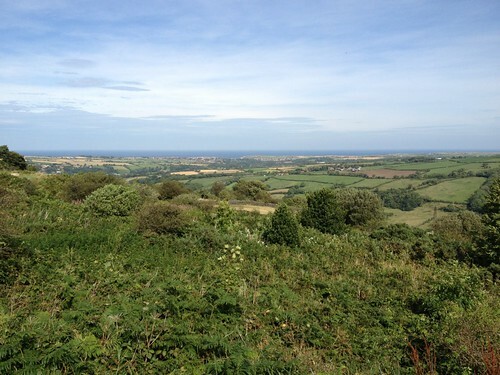 The finest view though, is from the summit of Blue Bank at the very eastern edge of the moor, near Beacon Howe and the Bridestones, from where one can see the whole bay – and indeed the Abbey itself. Being in Helmsley for the week – I couldn’t leave without a visit to its castle, and enjoyed the surprise of surviving 16th century wood panelling in the one remaining complete building of this medieval stronghold. I confess though it was quite satisfying to see how the great tower that was the visible symbol of Norman overlordship – looming over Helmsley’s market square – was felled by the Parliamentarians who destroyed this Royalist stronghold in 1644. It remained but to delight – on the last night in Helmsley – in the truly brilliant gastronomy available at The Star Inn in Harome, 2 miles away, where much of what one is served is grown out the back. This was a really fantastic meal – truly fine dining with the freshest of ingredients! Leaving my little one-bed self-catering cottage early on the last day, I took a detour on the road home to stop off on the edge of Ilkley Moor, for one last moorland walk up to the Twelve Apostles stone circle, a delightful (restored) circle of twelve small standing stones, with possibly the finest 360 panoramic vista of any circle I’ve ever seen – especially on what felt like the most glorious weather of the whole of 2012! This summer’s tourism is more generally Neolithic than specifically Megalithic, and closer to home than Spring’s sojourn to the Mediterranean. I am in North Yorkshire – staying in a little cottage in Helmsley – and have hippy rock musician Julian Cope’s ‘Modern Antiquarian’ (1998) with me, along with Teeside Archaeological Society’s Brian Smith and Alan Walker’s excellent ‘Rock Art & Ritual’ (2008) all about the unique Neolithic Rock Art of the North Yorks Moors, and Durham Archaeology Professor Chris Scarre’s ‘Megalithic Monuments of Britain and Ireland’ (2007) for more general reference. I also have OS Landranger Maps 94, 99, 100, and 101, and GoogleMaps and the OS Maps on my iPhone4S, along with its compass and excellent camera! 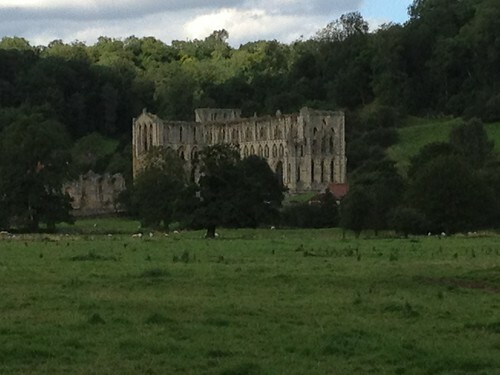 The first visit – being in Helmsley – was of course to walk the couple of miles up the Cleveland Way to the picturesque ruins of Rievaulx Abbey, Britain’s first Cistercian institution, from 1132 CE. A truly idyllic valley, it is little wonder that some six centuries later, the 17th century Fred Goodwin, Charles Dunscombe, upon acquiring the Helmsley estate (complete with ruined Norman castle at Helmsley as well as the ruined Abbey) should decide, not only to build the rather over-the-top Dunscombe Park country house, but to splash out on the then avant garde new-fangled ‘natural’ landscape garden known as Rievaulx Terrace, with its Tuscan and Ionic Temples, and its multiple vistas looking down onto the ruins of the Abbey. 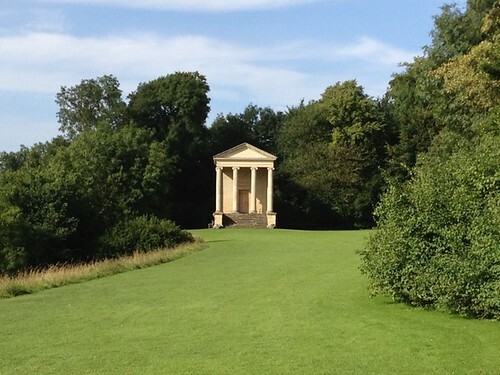 A really lovely place, this – you can imagine the late 17th/early 18th century posh-types promenading along here and taking Sunday lunch – apparently twice a year – in the Ionic Temple, built in Roman style but with Greek mythological stories painted on the ceiling. Its a giant fridge magnet proving to all who care to visit that Charles Dunscombe – commoner made good through the (then relatively) new wonders of modern banking – had been on the Grand Tour and seen where the Classics came from. His son married into blue blood and the family added a title to their conspicuous wealth. 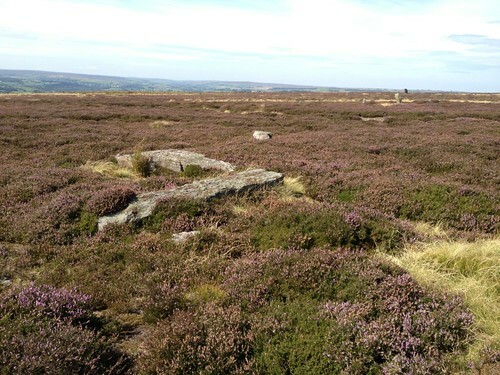 But of course the main reasons to be in North Yorkshire are Neolithic: specifically the two sacred landscapes to the West and to the Southeast of the Moors, and the numerous sites – and in particular the rock art – up on the heights of the Moors themselves. The sacred landscape to the West is the plateau of land between the Rivers Ure and Swale, roughly between Northallerton in the north and Ripon in the South. Cope’s book tells the story well and I refer the reader to his account for more detail. 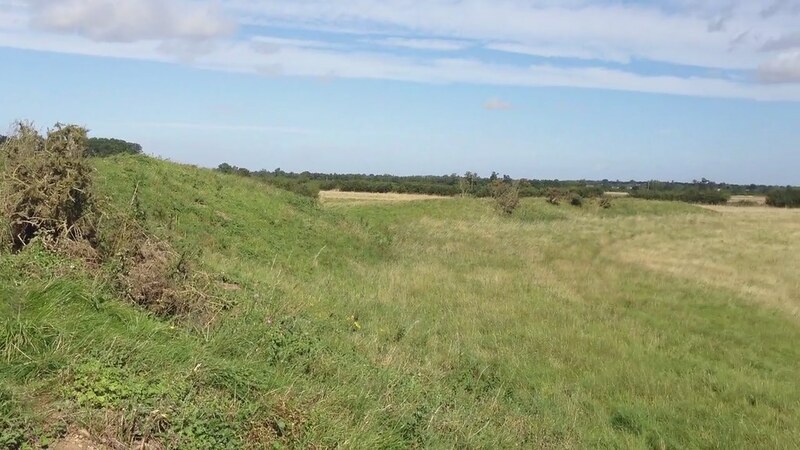 [I also refer you to the Friends of Thornborough website – in particular to news of a fresh application to quarry up to the edge of the site!] 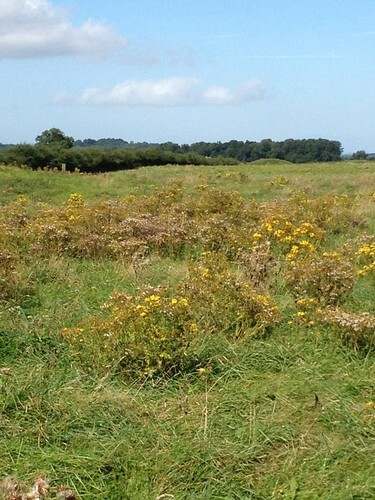 My own visit focussed upon two sites – the Thornborough Henges in the north, and the Devil’s Arrows in the south. Both these sites have survived the ravages of time only barely. As Scarre asserts, henges are Late Neolithic (3rd millenium BCE) cousins of cursus monuments, stone and timber circles, and stone rows, where the high bank is usually outside the ditch (unlike Stonehenge, which is both a henge and a stone circle, and where the bank is inside the ditch). Henge, therefore, is not the best word, frankly, but we’re stuck with it. These monuments are not numerous, possibly because they are quite easily ploughed out of existence by farmers who’d rather not plough round them. 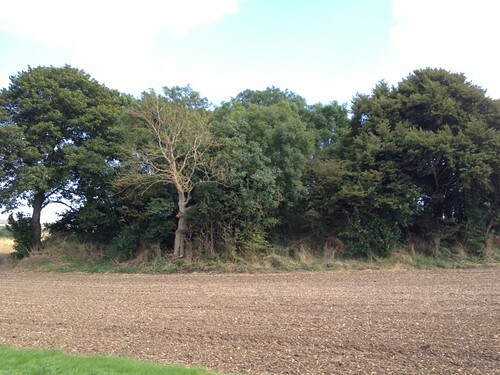 The three Thornborough Henges are in a row, roughly Northwest to Southeast, and the best preserved is the one that is forested over – called Camp Wood. The next best is the central monument, whose outer bank has collapsed in several places, but which still rises here and there to a good height. The cursus monument – probably earlier than the henge – that runs across the southern edge of the central henge, is all but indistinguishable from the modern landscape – I think the single track tarmaced road probably runs along it. The southernmost henge is inaccessible unless you’re happy to walk through a field full of young bulls, or walk around it until you find one of the small breaks in the hedge where there is a white tube covering the top line of barbed wire where you can climb over. It is very depleted by the ravages of time. The incessant beeping of trucks at the gravel pit described by Cope in the 1990s is no more – indeed the gravel pits are now reclaimed as a nature reserve a little way down Moor Lane that includes a useful car park where you can leave your car before exploring the three monuments. Visiting all three is a must – you get a clear idea of the depth of the ditch and height of the bank (and width of the top of the bank) in Camp Wood, and, without the tree cover, a good idea of the scale and grandeur of the henges in the central monument. From the southern henge, you can look north back across the tops of the highest surviving ridges of the bank around the central monument to the trees of Camp Wood in the north and get a real feel for how the three monuments may have worked together in the past, with a Processional Way of some kind linking the three, no doubt, though no sign beyond field boundaries remains of such a Way, that I could ascertain. 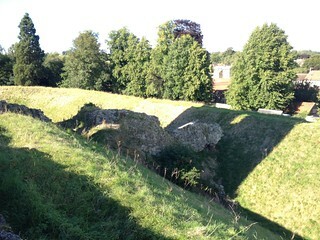 Satisfied with my visit to the henges – a good two hours of clambering that made me grateful for my boots and long trousers, despite the heat of the late summer – I made next for Boroughbridge, a small town a short way down the A1(M) from Thornborough. As Cope describes so vividly, this dead-straight Roman road completely cuts through this landscape, and in its modern motorway form cuts one off from the surrounding landscape too, as you drive from junction to junction. But there is worse to come. Arriving at Boroughbridge you discover just how completely an ancient sacred monument can be disrespected in the modern era. 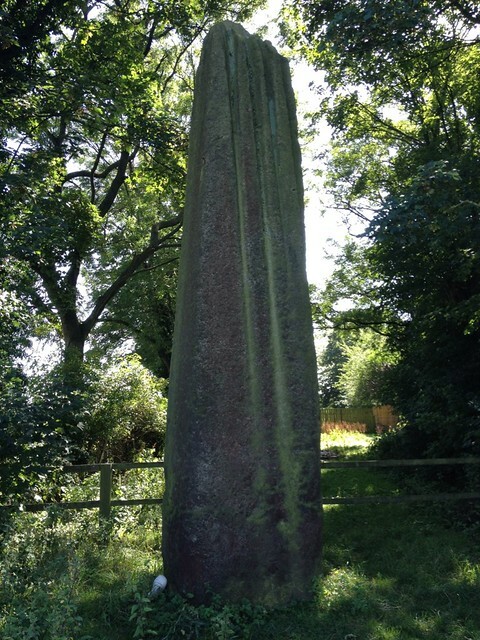 The three Devil’s Arrows – a row of three supremely tall monuments of grit stone, scored by rainwater in great deep scratches from summit to base – are separated by the road, which cuts through them right next to the northernmost, and tallest, stone. 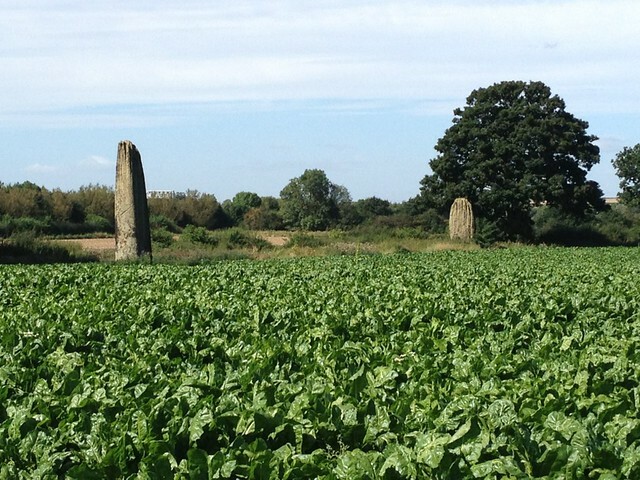 The other side of the road, behind a tall hedge, the two remaining stones are completely inaccessible in the midst of a large field of cabbages. Heartbreakingly desolate, this ancient sacred site is quite desecrated, and after the briefest of visits I pressed on, eager to leave the place as soon as possible. Very sad. The sacred landscape to the Southeast of the Moors has, I’m sorry to say, faired only a little better. 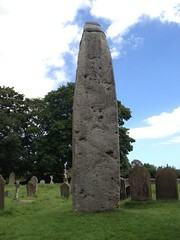 The centrepiece is the largest monolith in Britain, the Rudston Monolith, erected on a natural mound c2000 BCE, and rising over 26ft in height, today capped with iron to stop it eroding. Around it stands the graveyard of a Norman church – Rudston’s All Saints Parish Church. 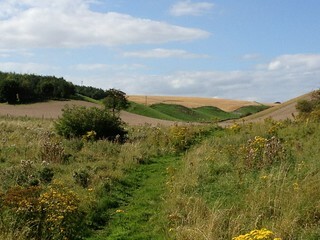 Yet in the landscape of four thousand years ago there are no less than four cursus monuments – including the 2.5mile long Argham Cursus – that meet here at Rudston, along the little rivulet the Gypsey Race. Nearby are a number of ancient Howes – the finest outside of Wiltshire – including Willy Howe, where amidst the bracken and undergrowth of the tree covered mound I found a ‘Whiteleafed’ thorn tree, and added a strip of my handkerchief as a little offering to the tree, the Howe, and the landscape around. It was truly heartening to see that this Howe is not only visited, but clearly frequented by other Pagan-minded people who partake in one of the most ancient of customs – the making of Whiteleafed trees. 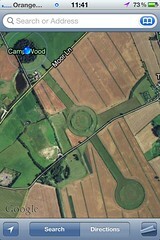 This concluded my visits to the two sacred Neolithic landscapes around the Moors. I couldn’t resist, however, whilst here, a few miles of the Wolds Way, and a glimpse of the Iron Age earthworks that comprise Camp Dale. Heavily agricultural now, the area is difficult to access beyond the bounds of the path, and the Camp itself inaccessible, but the earthworks remain, nonetheless, impressive! Tomorrow – the Moors themselves!